1. Hunting (or Sevso) Plate. Diameter: 70.5 cm; weight: 8873 g.
2. Meleager Plate. Diameter: 69.4 cm; weight: 8606 g.
3. Achilles Plate. Diameter: 72 cm; 11,786 g.
4. Geometric Plate: Diameter: 64.2 cm; weight: 7150 g.
5. Amphora. Height: 38.5 cm; 2506 g.
6. Dionysiac Ewer. Height: 43.5 cm; weight 3000 g.
7. Animal Ewer. Height: 51 cm; weight: 3983 g.
8. Hippolytus Situla A. Height: 22.7 cm; weight: 4436 g.
9. Hippolytus Situla B. Height: 22.9 cm; weight: 4478 g.
10. Hippolytus Ewer. Height: 57.3 cm; weight: 4051 g.
11. Geometric Ewer A. Height: 52.8 cm; weight: 2804 g.
12. Geometric Ewer B. Height: 55 cm; weight: 2671 g.
13. Basin. Diameter: 45.2–46.8 cm; weight: 2118 g.
14. Casket. Height: 32 cm; weight: 2051 g.
15. Copper cauldron: Height: 32.5 cm; diameter: 83.5 cm. It is thought that the individual components of the Treasure were manufactured at different times, although there is no expert consensus about dating, with suggested ranges including: mid-fourth century AD to early-fifth century AD (Mango and Bennett 1994); late-third century AD to late-fourth century AD (Painter 1990); and mid-fourth century AD to late-fourth century AD (Visy 2012). The treasure takes its name from the Hunting (or Sevso) Plate. An inscription around the central medallion reads in translation ‘May these, O Sevso, yours for many ages be, small vessels fit to serve your offspring worthily’ (Mango 1994: 77), which identifies Sevso as donor or recipient of the plate (Painter 1990: 6; Visy 2012: 10). The medallion itself shows a hunting and picnic scene, including the label ‘PELSO’ positioned between a servant butchering a boar and a body of water containing fish. Mango believes ‘PELSO’ might apply to the water, the servant, the boar, or even a small dog, which is also seen close to the servant (Mango and Bennett 1994: 78). Painter (1990: 6) and Visy (2012: 10) think it most likely that PELSO is intended to identify the body of water as Lacus Pelso, the Roman name for Lake Balaton in western Hungary. The findspot and early trading history of the Treasure are obscure. However, its constituent pieces are generally assumed to comprise a single find, or hoard, and not an artificially assembled collection of archaeologically unrelated pieces brought together by a modern seller in order to increase their aggregate monetary value. Impressions formed by the rims of the four large plates can be seen in the corrosion layer of the copper cauldron, and an accurately measured computer reconstruction has shown how all of the pieces could have been packed into the cauldron (Mango and Bennett 1994: 23–25, Figure A-6). May 1981, the Achilles Plate, £525,000 (Norman and Hoving 1991: 3). December 1981, one of the Hippolytus situlae, £525,000 (Norman and Hoving 1991: 4). All told, for their eight pieces, Wilson and Zietz paid more than £2.2 million (Eddy 1998: 46). The continuing and escalating cost of acquiring the silver piece by piece forced Wilson and Zietz to search out further partners. Peter Mimpriss of Allen and Overy was lawyer to Wilson and was also lawyer to the Marquess of Northampton. In November 1981 he suggested to Wilson that Northampton might be interested (Norman and Hoving 1991: 1, 4; Eddy 1998: 45; Kurzweil et al 2005: 84). Wilson prepared a ten-page prospectus describing the Treasure as it then stood of eight pieces, writing that: ‘In 1980, farm workers in the Lebanon discovered on their land an underground chamber. This contained silver objects of the highest importance …’. He also emphasized that the material was accompanied by appropriate Lebanese export documentation (Norman and Hoving 1991: 4). In 1982, Northampton viewed the material in Zurich (D’Arcy 1993), and on 15 September 1982 the Abraham Trust was formed to represent the interests of Wilson, Zietz and Northampton. The Trust assumed ownership of the eight pieces already bought by Wilson and Zietz (Norman and Hoving 1991: 4), together with two further pieces purchased at the time by Northampton for £500,000 (Eddy 1998: 46). In 1982, the collection as it was by then of ten pieces was viewed by a small number of scholars in a Rothschild bank vault in Zurich (Painter 1990: 5). In early 1984, the Abraham Trust tried to sell the silver to the J. Paul Getty Museum, persuading Guernsey-based antiques dealer Geoffrey Jenkinson to pose as ‘owner’ of the treasure to facilitate its sale for an eight per cent commission (Norman and Hoving 1991: 4). In May 1984, the silver was shipped to the Getty on approval (Norman and Hoving 1991: 4). Antiquities curator Arthur Houghton of the Getty had already questioned the validity of the associated Lebanese export documentation, however, and in March 1984 he had received confirmation that the authorizing signatures were forged and that Korban was not recognized by the Lebanese authorities as a registered dealer (Norman and Hoving 1991: 4; Kurzweil et al 2005: 84). 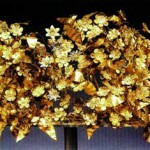 Because of what it considered to be forged documentation, the Getty decided against buying the treasure (True 1997: 140). In June 1984, Peter Wilson died, and his interest in Abraham and thus the silver was taken up by his sons Philip and Tom Wilson (Norman and Hoving 1991: 4). A few days later, Mimpriss received word from the Getty about the forged documentation (Norman and Hoving 1991: 4). He responded by contacting Lebanese businessman Ramiz Rizk to obtain replacement documentation, which was finally obtained in 1985 at a cost of £628,000 for ‘all expenses including taxes’ (Norman and Hoving 1991: 5; Kurzweil et al 2005: 84; Eddy 1998: 45). A second attempt to sell the Treasure to the Getty failed, and other museums and collectors were also holding back (Norman and Hoving 1991: 5). April 1987, the Animal Ewer and the Meleager Plate (Norman and Hoving 1991: 5). Export permits for these four pieces were again obtained through the mediation of Rizk in Beirut for payment of a further $460,000 (Norman and Hoving 1991: 5; Eddy 1998: 46). Around this time, the ‘Marquess of Northampton 1987 Settlement Trust’ became the sole owner of the silver, and Northampton entered into negotiations with Sotheby’s about a possible sale (Eddy 1998: 46; Norman and Hoving 1991: 3). In 1988 Northampton and Sotheby’s considered the acquisition of a large silver plate decorated with a Chi-Ro symbol in the centre, though expert advice suggested it was not part of the Sevso assemblage (Norman and Hoving 1991: 5; D’Arcy 1993: 162; Ruiz 2007b). On 10 February 1990, Sotheby’s announced the sale in New York of what it had dubbed the Sevso Treasure (Sotheby’s 1990; Norman and Keys 1990), with a Lebanese provenience and an estimated price of $50–100 million. Despite the Lebanese export permits, which apparently legitimized the material, Sotheby’s undertook to contact all 29 countries with territory falling inside the boundary of the fourth-century AD Roman Empire, together with UNESCO, Interpol, IFAR, and ICOM, enquiring after any adverse evidence or claims of ownership (Hoffman 2006: 170). 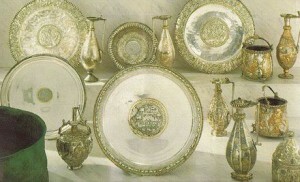 The Sotheby’s announcement was the first public revelation of the Treasure, and the supposition that it had been found in Lebanon caused that country to file suit in the New York State Supreme Court on 15 February 1990 claiming that the export documentation was forged, that the silver had been exported illegally from Lebanon, and challenging Northampton’s claim to ownership. In March 1990 a judge impounded the treasure (Kurzweil et al. 2005: 84; Lebanon 1990; Watson 1993). In 1990, it was reported that the silver might have been found in a cave close to the Croatian town of Pula and smuggled out of Yugoslavia in the late 1970s, prompting Yugoslavia too to stake a claim for ownership. This claim was inherited and maintained by Croatia after its secession from Yugoslavia in 1991 (Kurzweil et al 2005: 85). Finally, in 1991, Hungary announced its belief that the silver had been excavated in the vicinity of Polgárdi, 16 kilometres east of Lake Balaton, in the late 1970s, and also claimed ownership (Kurzweil et al. 2005: 85; Hajdú 2012). The trial commenced in September 1993. Lebanon relinquished its claim on the eve of the trial (Kurzweil et al 2005: 85). Seven weeks later, the jury concluded that neither Croatia nor Hungary could produce convincing evidence of provenience or ownership, thus reaffirming Northampton as the Sevso Treasure’s legal owner (Kurzweil et al. 2005: 87–92; Hoffman 1994). Hungary and Croatia expressed their grievance, however, that the court had not scrutinised the circumstances of Northampton’s acquisition of the silver nor had it forced him to defend his own title (Hoffman 1994; Hoffman 2006: 170, note 56; Hajdu 2012: 26–27). In early 1990, under pressure from Yugoslavia, London’s Metropolitan Police initiated a criminal investigation into the acquisition of the silver (D’Arcy 1993: 163; Norman and Hoving 1991: 3; Eddy 1998: 44), and by July 1990 had come to believe that there was evidence to suggest a conspiracy to defraud (Norman and Hoving 1991: 3). The police interviewed Northampton in October 1990, subsequently exonerating him of ‘any criminal intent’ and portraying him instead as the victim of a crime (Eddy 1998: 4). By early 1991, the focus of enquiry had shifted to Peter Mimpriss (Eddy 1998: 46), though by that time the Foreign Office, acting on the advice of a former ambassador to Washington (and by then a director of Sotheby’s (Eddy 1998: 46)), had suggested that the investigation should be ended (Eddy 1998: 46), and the Crown Prosecution Service had also advised that there was insufficient evidence to proceed. Although Northampton was keen for the investigation to continue, it was wound down (Eddy 1998: 46). In March 1991, Northampton sued Peter Mimpriss and Allen and Overy for damages caused by fraud, deceit and misrepresentation in relation to the acquisition and potential sale of the Treasure between 1981 and 1990 (Checkland 1992; Eddy 1998: 46; Renfrew 2000: 129–131). His claim hinged on his belief that the fraudulent export licences and the negative publicity attending the New York trial would deter any potential purchasers—the Treasure had become effectively unsaleable (Renfrew 2000: 49). In 1999, it was announced that the matter had been settled out-of-court and it was rumoured that Northampton had received £15 million in compensation (Alberge 1999). In November 2006, the silver was placed on display at Bonhams auction house in London for an invited audience of academics, curators, collectors and dealers, but it was not offered for sale (Bailey 2006). It had long been rumoured that the material bought by Northampton represented only part of the original find (Landesman 2001; Nagy and Tóth 1990: 6) and that there might be eight more vessels and 185 spoons (Norman and Hoving 1991: 2). In March 2007, The Art Newspaper claimed to have seen documents attesting to a further 187 spoons, 37 cups and five bowls, all said to be part of the original hoard (Ruiz 2007a). In March 2014 the Hungarian government announced that it had bought seven of the Treasure’s silver pieces along with the copper cauldron for €15 million. The pieces were the Hunting (Sevso) Plate, the Geometric Plate, both Geometric Ewers, the basin, the casket and the Dionysiac Ewer (Alberge 2014). Alberge, Dalya (1999), ‘Sevso treasure dispute settled’, Times, 8 May. Alberge, Dalya (2014), ‘Sevso treasure repatriated by Hungarian government after UK sale’, Guardian, 27 March. Bailey, Martin (2006), ‘Bonhams U-turn on Sevso silver’, Art Newspaper November, 5. Checkland, Sara Jane (1992), ‘Lawyers accuse Yard of dragging feet over silver hoard’, Times, 3 August. D’Arcy, David (1993), ‘Shadow of the Sevso Treasure’, Vanity Fair, October, 151–168. Eddy, Paul (1998), ‘Hot metal: How an aristocrat lost a vast fortune on treasure that is now worth next to nothing’, Sunday Times Magazine, 1 March, 43–46. Hajdú, Éva (2012), ‘The Seuso treasure and Hungary’, in Zsolt Visy (ed. ), The Sevso Treasure and Pannonia (Pécs: Régészet Tanszék – Genianet), 23–34. Hoffman, Barbara (1994), ‘Sevso follies of 1994’, Archaeology, May/June, 42–43. Hoffman, Barbara (2006), ‘International art transactions and the resolution of art and cultural property disputes: a United States perspective’, in Barbara T. Hoffman (ed. ), Art and Cultural Heritage: Law, Policy and Practice (Cambridge: Cambridge University Press), 159-177. Kurzweil, Harvey, Gagion, Leo V., and De Walden, Ludovic (2005), ‘The trial of the Sevso Treasure’, in Kate Fitz Gibbon (ed. ), Who Owns the Past? Cultural Policy, Cultural Property and the Law (New Brunswick: Rutgers University Press), 83–96. Mango, Marlia M. and Bennett, Anna (1994), The Sevso Treasure. Part One (Rhode Island: Journal of Roman Archaeology Supplementary Series 12.1). Nagy, Mihály and Tóth, Endre (1990), ‘The Seuso Treasure. The Pannonian Connection?’, Minerva, 1(7), 5–11. Norman, Geraldine and Hoving, Thomas (1991), ‘Inside the silver syndicate’, Independent on Sunday, 29 December, 2–5. Norman, Geraldine and Keys, David (1990), ‘Sotheby’s sale of silver “a daring move’’’, Independent, 9 February. Painter, Kenneth (1990), ‘The Seuso Treasure’, Minerva, January, 4–11. Renfrew, Colin (2000), Loot, Legitimacy and Ownership (London: Duckworth). Ruiz, Christina (2007a), ‘The silver missing from the Sevso hoard’, Art Newspaper, March, 1, 4. Ruiz, Christina (2007b), ‘The missing plate from the Sevso hoard’, Art Newspaper, April, 6. Sotheby’s (1990), The Sevso Treasure: A Collection from Late Antiquity. The Property of the Marquess of Northampton Settlement : Sold by Order of the Trustee (London: Sotheby’s). True, Marion (1997), ‘Refining policy to promote partnership’, Antichità Senza Provenienza II (Bolletino d’Arte; Rome: Ministero per i Beni e le Attività Culturali), 137-46. Visy, Zsolt (2012), ‘The known objects of the Sevso Treasure’, in Zsolt Visy (ed. ), The Sevso Treasure and Pannonia (Pécs: Régészet Tanszék – Genianet), 7–22. Watson, Peter (1993), ‘Noble shows his class in battle over silver hoard’, Observer 19 September.